At least five dogs have been sickened and one has died after eating Evanger’s “Hunk of Beef” canned food. A barbiturate, Pentobarbital, has been confirmed in one lot of the food and the company is concerned people may still have unused cans in their homes. 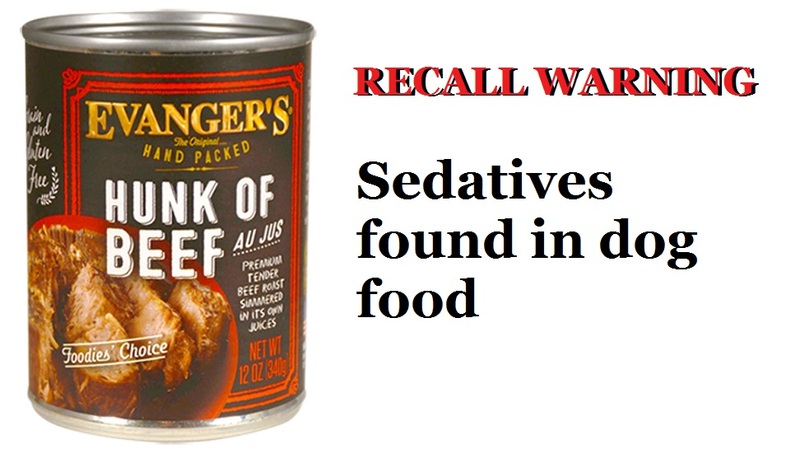 Evanger’s Dog & Cat Food of Wheeling, IL, is recalling five lots of 12-ounce cans of “Hunk of Beef” dog food that have expiration dates of June 2020, according to the recall notice posted on the Food and Drug Administration website. The company distributed the recalled dog food to retailers in 15 states: Washington, California, Minnesota, Illinois, Indiana, Michigan, Wisconsin, Ohio, Pennsylvania, New York, Massachusetts, Maryland, South Carolina, Georgia and Florida. The recalled dog food was manufactured the week of June 6-13, 2016. Only cans with one of the above numbers, an expiration date of June 2020, and barcodes that have 20109 in the second half. The barcodes can be found on the back of the product labels. The barbiturate Pentobarbital is a sedative and if ingested by animals it can cause drowsiness, dizziness, excitement, loss of balance, nausea and, in extreme cases, death. The implicated beef was not used in any other Evanger’s products. Pingback: Sedatives in Dog Food Recall – FIREPAW, Inc.